While the movement celebrating body diversity continues to grow, retail offerings still have a little catching up to do. One market where that’s especially true is bridal. A quick Google search will show you mostly one silhouette: super poofy, as if bridal designers assume a full-figured woman wouldn’t want to show off her figure. Today, Stone Fox Bride changes that. 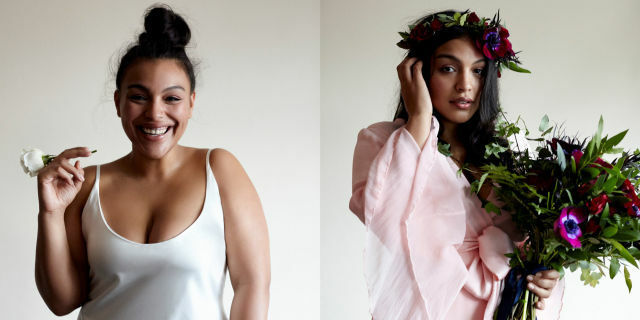 The boho-chic brand has teamed up with Eloquii to offer a capsule collection of wedding dresses in sizes 16 through 24, including five styles from Stone Fox Bride’s main collection. Prices range from $4,350 to $6,800 and include a variety of styles: a strapless peplum tea-length dress, an empire waist wrap dress, a silk slip dress, a bell-sleeve dress (which you might remember was worn by Marnie for her wedding in Girls), and a even a rose-colored chiffon one. Not a gigantic tulle skirt in sight. In addition to this collection, Stone Fox Bride creative director Molly Guy curated a selection of special-occasion dresses for wedding season on Eloquii.